In investing, and in business, knowing what consumers will want next is the key. Let's take a look at how three critical trends will shape the DIY real estate investing space and what it means for Scripps Networks, Home Depot and Lowe's. I have a very simple strategy when it comes to investing. I feel that great investments are born when a great company meets a game-changing trend. No one can deny that the real estate market has changed a great deal since the market crash of 2008. The only question is, has anything changed for the better? While the market has stepped back overall, I think three game changing trends are shifting the real estate investing landscape, and between Scripps Networks (NASDAQ:SNI), Home Depot (NYSE:HD) and Lowe's (NYSE:LOW), two will be among the big winners. Call it a thrifty consumer, or call it what you will, but when it comes to home repairs, the U.S. is becoming a do-it-yourself nation. A recent survey by MainStreet.com revealed that 70% of Americans prefer "do-it-yourself" when it comes to home repair projects, over professionals. All that ambition has led to a huge market for home repair television and tutorials; which has changed one stock from an also-ran to a true blue chip. Scripps Networks(NASDAQ:SNI) is a media conglomerate which owns a series of lifestyle content brands. If you're watching any type of competitive house hunting or home repair show, the chances are your watching a Scripps brand. The housing channels (HGTV and DIY Network) account for 39% of Scripps revenues. Scripps has been on a tear as it has grown earnings 22%, and revenue 10% annually, since the real estate market crashed. During that time the stock is up four-fold, yet it still trades at a multiple of just 17. With these emerging trends, I really believe that the future looks bright for Scripps. There's two other trends, that are playing off of each other, and rapidly changing the housing landscape. First, the rental market is absolutely on fire. Rental prices have continued to increase, outpacing both inflation and income growth. As would-be home buyers still struggle getting credit, a higher percentage of home sales are being made by investors. 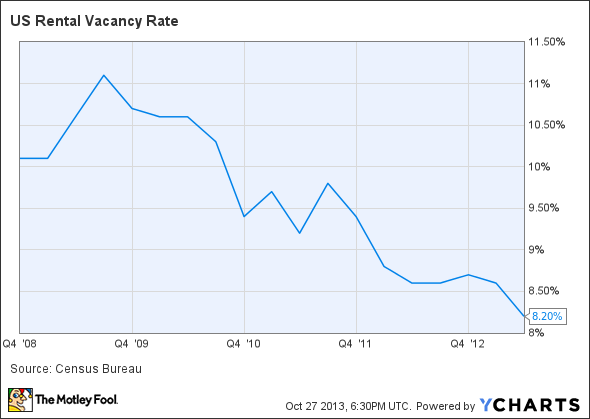 This has led to skyrocketing rental rates, an rental vacancy is at a multi-year low. At the same time, home values also haven't rebounded to pre-recession levels yet, and increases in home prices have slowed as of late. This means two things: home buyers who can't sell but need to up-size are taking on land-lording, and tight credit means a pent up market of home buyers should exist for a while. In short, real estate looks bullish but different; and it's changing the notion of what an industry leader looks like. When you add up these three trends, a DIY nation mixed with tight credit and increased land-lording home repair looks incredibly bullish. While home builders need conditions to stay ripe for new purchases; the home repair industry benefits from land-lording now, and will continue to benefit, from pent-up demand, as credit loosens. That means good things for the companies that make housing materials, and those that sell them. It's clear that Home Depot(NYSE:HD) is the undisputed leader, and best of breed brand, in the home repair retail space. 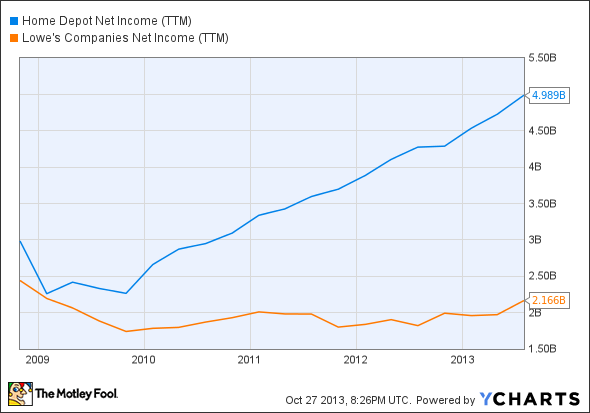 In recent years, Home Depot's net income has skyrocketed past Lowe's(NYSE:LOW) in recent years, by quite a wide margin. 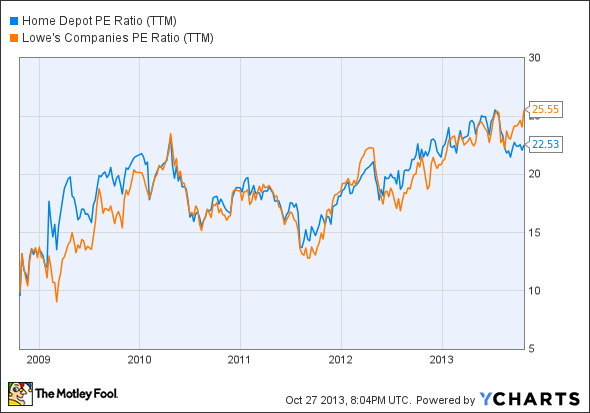 Still, as the chart below illustrates, Home Depot trades at a cheaper multiple than competitor Lowe's does, and it isn't trading that much higher than its historical average. Even the most novice real estate observer can tell that real estate isn't the same as it once was, but that's not all bad news. Shifting economics, and changes in consumer sentiment, are creating a new generation of land-lords and DIY enthusiasts. I feel that Home Depot and Scripps Networks have the wind at their backs with these trends, which is something that should be kept in mind if you're assessing their valuation. They could continue to run for quite some time.